Aikido, meaning " the way to union with universal energy ", is a modern Japanese martial art developed by Morihei Ueshiba over the period of the 1930s to the 1960s. Aikido contains a very significant spiritual component which is the result of Ueshiba's interaction with religion, such as Shinto and Buddhism. Thus, Aikido is also refered to as 'the way of spiritual harmony' or 'the art of peace'. Both interpretations draw attention to the fact that aikido's techniques are designed to harmonize with an attack by redirecting the energy instead of blocking it. An analogy is often made of the way a flexible willow bends with the storm, whereas the stout oak will break if the wind blows too hard. Aikido incorporates a wide range of techniques which use principles of energy and motion to redirect, neutralize and control attackers. One of the central martial philosophies of aikido is to be able to handle multiple-attacker circumstances fluidly. 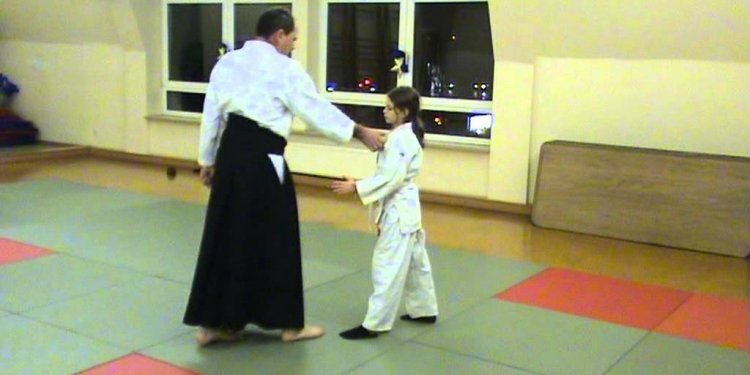 Randori, practice against multiple opponents, is a key part of the curriculum in most aikido schools and is required for the higher level belts. The methods of training in a class consists of a teacher demonstrating techniques or principles which the students then practice. Training is done through mutual technique, where the focus is on entering and blending (harmonising) with the attack, rather than on meeting force with force. uke, the receiver of the technique, usually initiates an attack against nage who neutralises this attack with an aikido technique. Ueshiba taught that, while it was important to become proficient in physical technique, this is not the ultimate purpose of training. He taught that the principles learned through training in physical technique are universal and are to be applied to all of one's life.